Have you ever had the flu? The real flu. Full-fledged flu. If you have to give it a thought, the answer is no. Anyone who has ever had the flu will not forget it and will give a resounding “Yes!” with a groan when asked that question. It’s about 5 days’ worth of down-right misery. Which, brings me to say, NIVW is a great opportunity to remind everyone that it’s not too late to get a flu vaccine! Anyone 6 months and older should receive an annual flu shot. Your Public Health Nurse, local Pharmacist or Physician has flu vaccine available. (Although, this Public Health Nurse will not vaccinate anyone under 6 years old, I can certainly point you in the right direction). Flu vaccinations will continue through May. There are always a few people out there that will tell you they don’t get the flu shot because they or someone they know got the flu from it. Or, “what’s the use, I still got the flu after receiving the vaccine”. My favorite is “I have never gotten the shot and I have never gotten the flu, so why start now?!”. Here’s the real story: 1. It takes about 2 weeks for the vaccine antibodies to build up in your system. 2. People can have the flu in their system for 5-7 days before they actually have symptoms. 3. There’s a first time for everything. So….if an individual gets the flu shortly after they get the vaccine, it’s because they either were exposed to someone before the antibodies built up, or, they actually had the virus in their system but it didn’t surface yet. In answer to that last one, no one is naturally immune to it. There will be people who receive the vaccine, but do end up with the flu at some point during the flu season. But in this scenario, the symptoms won’t be as severe. At a seminar last year, an individual stood up and commented that she got the vaccine but a month or so later got the flu. A state epidemiologist responded by asking “did you die?”. Her point being, people die from the flu. If an individual receives the flu vaccine, the effects of the virus will be less. The bottom line is, that flu vaccines reduce deaths, especially in children and elderly and can make flu symptoms and complications from the flu milder. Labor Day marks the end of water quality testing at Sandy Beach for the year and the Board of Health receives a brief report from their staff at the conclusion of testing. 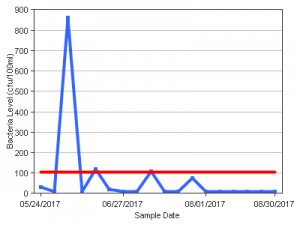 This year, Sandy Beach did quite well in terms of bacteria levels. To summarize the requirements in Massachusetts for a Public Bathing Beach, a sample must be taken weekly. The results of a single sample must not exceed 104 colony forming units per 100mL of Enterococci. Enterococci itself does not cause human illness. It is simply an indicator of pollution. In addition to the single sample limits, the geometric mean of the 5 most recent samples shall not exceed 35. The weekly results for single samples showed three exceedances this year, all of which occurred after very heavy rainfall events. This is why it is vital that trash and animal feces not be put into our storm drains or left on the streets and sidewalks. Eventually, it will contaminate our surface waters. In the first graph above, you can see our Geometric Mean results. None of which failed. 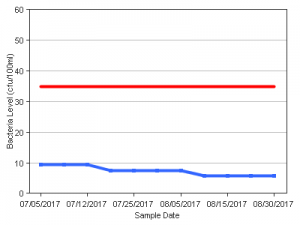 The second graph shows our single sample results including the 3 results which went over the 104 CFU/100mL requirement. These results are in line with the history of testing at Sandy Beach. Testing will resume once again after next Memorial Day. The Board of Health met for their regularly scheduled meeting on August 1st here at Town Hall. If you recall from last month the Board voted at the June meeting to cancel their July meeting. The Board reviewed the minutes of the June meeting and approved them unanimously. They also made note of part-time Inspector Melanie Dineen’s absence. Carleo informed them that she has taken a full-time position with the Medford Health Department. The Board wished her success in her budding career in Environmental Public Health. Carleo expressed his wish to fill the position quickly. Carleo brought up the FDA Retail Program Standards which Danvers is enrolled in. Since the June meeting, he has completed the documentation for standard 3 which ensures that our inspection program is based on HACCP principles. The Board will be provided a copy of the policies he recommends under this standard for adoption at the September meeting. Up next on the agenda was a request for a variance from the Food Code as submitted by the Person-In-Charge of foodservice for Benchmark Putnam Farm at 9 Summer Street. After hearing from all parties, the Board voted to grant a provisional variance for one month. During this time, Carleo will inspect the operation for hazards. If any hazard cannot be controlled, the variance will be revoked. The Board received an update on their Environmental Health program. The report included permits issued and investigations conducted since the last meeting. Continuing from the previous meeting, Carleo updated the Board on the activities at 55 Clinton Avenue. Since the June meeting the Police Department had notified the homeless individuals present at the site that the property has been posted “NO TRESPASSING” and that they were expected to vacate forthwith or face possible legal action including arrest. Town Counsel has contacted the owner to warn that the property must still be cleaned up and that the Board of Health will see to it. Carleo was not aware of a response from the owners at this time. Nurse Ryan provided a written report to Carleo to update the Board. In sum, Ryan recently presented a seminar at the Senior Center with a decent turnout on the subject of dementia behaviors. Carleo remarked that it was good to see more health education along with the routine health promotion activities that our Nurse engages in. Since the last meeting, Ryan assisted the City of Gloucester with the vaccination of Gloucester Fire and Police Departments for Hep B and Tetanus. Additionally, she provided shingles vaccines to homebound elderly residents. She also recently attended a Middlesex Sherriff’s Conference for the Heroin Education Awareness Taskforce. And finally, at her recent Public Health Nurse’s monthly meeting, they toured the quality control building for Legal Seafood in Boston’s Seaport. Since the June 1 meeting, Ryan investigated 2 cases of Campylobacteriosis, 1 case of Giardiasis, 1 Group B Streptococcus, 1 Haemophilus Influenza, 1 Hepatitis B, 2 Hepatitis C, 1 Human Granulocytic Anaplasmosis, 1 Tuberculosis and 1 case of Varicella. Notably, the one Direct Observation Therapy treatment for an active TB case ended on July 3rd. Additionally, the varicella case was vaccinated. During the infectious stage of disease there was contacted with an unvaccinated child. The unvaccinated child was quarantined and did not contract illness. Dr McLaughlin inquired how this unvaccinated child was allowed in the school. Carleo stated he was unsure but the child possibly had an exemption from vaccination. Carleo informed the Board that Sanctuary Medicinals has received approval from the Board of Selectman to move forward with their planned 2 Electronics Avenue location. Their next step is licensure through MDPH. As they operate other facilities within MA their license will most likely be issued. Carleo reported on a staggering 148 animal issues reported since the June meeting. 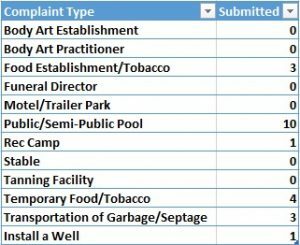 Over 40 of these complaints alone were on wildlife nuisances. Do you ever wonder if your forgetfulness is normal or the sign of something wrong? We all lead very busy lives, always on the go, often toggling many things at one time. This in turn can lead to forgetting things such as forgetting where you parked your car; having a child insist you said “yes” when you can’t ever imagine saying yes to that request; forgetting about an appointment; and on and on. Most of the time these forgetful moments are benign. But when is it not? How can you decipher the normal forgetfulness from the worrisome kind? Dementia is a general term. There are many causes of dementia: Vascular, severe alcohol abuse, traumatic brain injury, Parkinson’s, Lewy body and Alzheimer’s. Alzheimer’s is the most common cause of dementia. According to the Alzheimer’s Association, there are an estimated 5.5 million Americans living with Alzheimer's, the majority being 65 or older. But it can affect people younger as well. As always, if you are concerned, contact your doctor. The Board of Health met for their regularly scheduled meeting on June 1st here at Town Hall. After approving the previous month’s minutes, and amending their meeting schedule to exclude July and December meetings, they were asked to consider reducing the fee for a temporary food establishment. 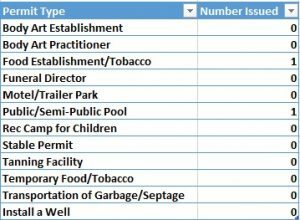 Our fee schedule required a payment of $125 to the Town for the issuance of a Temporary Permit to Operate a Food Establishment. For many applicants seeking only to sell some bottled drinks and packaged items, or charities, this was simply too much to ask. We know from history that if you make compliance unreasonably difficult or downright impossible, then you can’t honestly expect to receive acceptable rates of compliance. So, the Board voted to reduce the fee from $125 dollars to a mere $35 in the hopes that more temporary food vendors will reach out to us for permitting voluntarily. This new fee is effective immediately. Of note, Carleo highlighted a cluster of Listeria Monocytogenes cases with the same PFGE (essentially the same DNA or fingerprint) which is being investigated by the MA Department of Public Health. Danvers was asked to consider the food history of one subject which had eaten in Danvers. Information was gathered and sent back to DPH for review as part of their case. Now, there was no reason to believe that the outbreak was caused by a Danvers establishment, but we investigated this as it may have been a part of a multi-jurisdictional product sold in the establishment which could result in a recall. Continuing from the previous meeting, Carleo updated the Board on the activities at 55 Clinton Avenue. Since the May meeting, the owner has installed the “No Trespassing” signage as requested. Next comes the removal of the material on the site. Staff will continue attempting to work with Orchard Farm Trust to resolve this issue. Carleo attended a multi-community Program Standards Sharing Session in Acton on the 17th. The session was informative and well worth attending. We now have sufficient data to begin working on Standard 3. This Standard will ensure an inspection program which is based on HACCP Principles. 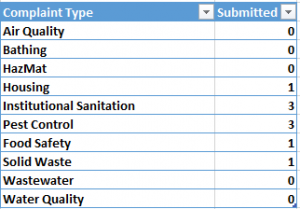 Much of the requirements we already have in place such as an inspection form which requires the selection of “in, out, NA or NO” when addressing Risk Factors and Interventions, risk categorization of establishments, a risk based inspection schedule, on-site correction of out of control risk factors and discussion of long-term control of risk factors. However; we need to put these requirements and activities into actual policy that can be verified going forward. This should be completed by the August meeting. Nurse Ryan provided a written report to Carleo to update the Board. In sum, she attended the Danvers Cares Substance Abuse Awareness Walk which had a fantastic turnout and great speakers. The annual MA Public Health Nurse’s Conference was largely on Substance Abuse as well. The Diaper Drive this past April was a bit of a let down. Only 518 diapers were donated which is much less than last year. Other communities reported a decline in donations as well. Nurse Ryan’s high school interns have completed their internship. One has been hired for a summer job with the Social Seniors Program. All were accepted into Nursing School. Since the last meeting, Nurse Ryan received reports of 1 Hep C case, 2 Influenza cases and 1 Salmonellosis case. Ryan provided the Board some data about influenza infections compared to the statewide numbers. Carleo informed the Board that Sanctuary Medicinals had met with key Town Hall staff regarding their proposed dispensary at 2 Electronics Avenue. They have some permitting hurdles to clear, but have experience which indicates this project will likely move forward as planned. They will be meeting with the Board of Selectmen next. Jean Marcotti provided Carleo with a monthly briefing on her activities. In sum, there were a few dog on dog bites, but most notably was the increase of wildlife concern calls which increased to 21 for the month. With no further business, the Board of Health adjourned their meeting. The next regularly scheduled meeting is set for August 3rd at 7pm here at Town Hall. This is a grave topic (intentional pun) intentionally timed for Memorial Day, with all due respect, to relate burial grounds, veterans, and public health. I hope you find it interesting. By now, most of the veteran gravesites have been flagged. It was a cold rainy season to fulfill this annual obligation. The charge to this office is done mostly by volunteers every year at this time, as it is done collectively across our nation of cities and towns. The tradition in Danvers glues our heritage to our youth. For example, prominent Revolutionary War Patriot Samuel Holten rests in peace with his extended family less than a mile from Town Hall; A small American Flag was placed at his gravesite earlier this week by one of the many Danvers Girl Scouts who do incredible volunteer work on this laborious project. Judge Holten can be viewed in the foyer of Town Hall as he leaves for the Continental Congress, of which he would preside. Not two miles from the Holten Cemetery lies the Endicott-Russell burial grounds where decedents of prominent colonial Governor John Endicott are buried. Many corpses in that graveyard were Revolutionary War veterans and are identified with a small American flag as well. These are but two of an estimated 2,392 veterans buried in 17 private and abandoned cemeteries across Town plus one cluster of Jewish Cemeteries located off Buxton Road. And this office tries to locate and show respect by placing an American flag upon their resting site before Memorial Day. The volunteers do it because of their deep devotion and curiosity. While I also hold these men and women in deep regard, it is the Law of the Commonwealth that requires me to fulfill my obligation. For example, when a veteran is buried, a certified copy of the veteran’s burial permit shall be maintained by the veterans' graves officer, appointed under section 9 of Chapter 115. This Massachusetts General Law also requires cities and towns to maintain veterans’ graves and to have a flag placed on all veterans’ graves for Memorial Day. This law was passed in 1861, around the beginning of the Civil War. So, May concludes with my consciousness raised for the sake of honoring veterans and, what is typically overlooked in our journey through life, public health reasoning behind the proper disposal of human remains. How lucky am I to have a career with such a diverse scope of interest regardless of the season? From a Letter to the Editor authored by Peter Mirandi published in the Salem News, May 23, 2017. 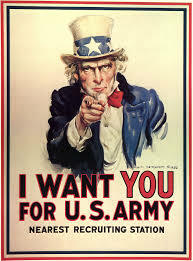 The famous poster stating, “I Want You”, is perhaps the most successful marketing tool in American history. A war machine was recruited time and again with a request from Uncle Sam, in his stars and stripes top hat. This is a patriotic appeal too. An appeal to answer the call of our civic duty. It targets children and adults of all ages; it matters not if you are male or female or if your abilities are limited. You need only the patriotic means to assist your Town, City or neighborhood in preparing to remember the people who died while serving in the country’s armed forces. Next week volunteers of every stripe will help decorate gravesites of veterans. Then comes Memorial Day and it is now that I ask you to conjure the image of Uncle Sam. This appeal is for civilian veterans to rise to the occasion and march like we did in boot camp or on drill fields, decks, or in battle. We must again answer the call. Spectators are always moved by the site of the men and women who served to protect our way of life. Perhaps now, as much as ever, Uncle Sam calls, “I Want You” to keep the local spirit stirred. I urge you, regardless of your military experience, to seriously consider that our duty carries on. Please answer the civic call to march on Memorial Day and for that, a grateful community thanks you. Last week and after many months of planning, new signs were installed at the four Squares in Danvers dedicated to prominent Danvers veterans. Local historians such as our Town Archivist, can certainly speak to the prominence the four men whose name adorns these Squares: Powers Square on the corner of Holten and Pine Streets; Lane Parkway on the corner of Lane Parkway and Conant Street; Woodman Square on the corner of Liberty, High and Water Streets; and my favorite, Carmichael Square on the corner of Forest and Maple Streets. These sites will be decorated with wreaths purchased by the Town from Curran’s Florist before Memorial Day. I’ll return to one of these sites after a few words on infectious diseases and I promise to connect the dots before signing off. unsanitary conditions, harsh weather and the subsequent disease was responsible, at least in part, for Napoleon’s defeat. corner of Forest and Maple Streets, was a well-known and well-like resident who went to Holten High School and was a pitcher on the baseball team. In 1918, just months before World War I ended, he was drafted and mustered off to Battery B of the 301st Field Artillery where he saw action in the European Theatre. A year later he was headed back to Danvers when he contracted influenza and perished. Unfortunately, this story is far from unique. 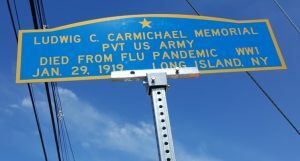 The Great Flu Pandemic of 1918 claimed the lives of many service men and civilians alike. The point of this Newsletter is to remind readers that war, a manmade public health atrocity, is shadowed by the naturally occurring threats to public health. When the two circumstances overlap, as they did with Napoleon’s Grande Armée, or closer to home as in the case of one of Danvers’ Finest, the impact is truly heartfelt. 1.) Special thanks to Richard Trask, Town Archivist for validating and providing further details for my story on Ludwig Carmichael. He also has details on Powers, Lane and Woodman if you’re interested. 2.) The US Centers for Disease Control & Prevention (CDC) has listed Rickettsia on their list of Bioterrorism Agents/Diseases. Maddening and how! On Thursday May 4th, the Board of Health met for their regularly scheduled meeting. If you have never attended a meeting of the Board of Health you are of course encouraged to attend. All meetings are open to the public. The purpose of these meetings is to review the business of the previous month taken on behalf of the Board by their staff, as well as to discuss and amend policy and sometimes to adopt new regulations for the protection of public health. We typically meet on the first Thursday of the month, however this occasionally needs to change. So please do check the calendar on the town’s site. First up was the quick administrative requirement of approving the minutes of the April meeting. The Board unanimously voted to approve those minutes as written. 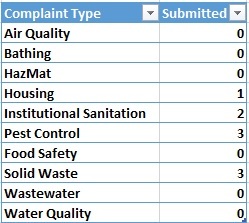 Next came the report on the activities of the Environmental Health programs such as permitting and investigations. Carleo reminded the Board that no routine permitting is occurring this time of year. However, over the next two months, we will be inspecting and permitting numerous semi-public swimming pools and special purpose pools as well as the recreational camps for children which operate in Town. Two Public Hearings were scheduled for this meeting date. The first hearing was for McKinnon’s Butcher Shop relative to the expansion of their food preparation operations and assurance that the equipment currently installed was suitable. Just prior to the hearing the only remaining issue was resolved between the Inspector and McKinnon’s so the hearing was cancelled. A second hearing for the owners of 55 Clinton Avenue relative to an order to cease the operation of an illegal dumpsite was postponed until the June meeting as the owner of the site was out of state. Carleo updated the Board on their activites under a $20,000 grant from the US Food and Drug Administration and the Association of Food and Drug Officials. The purpose of the grant is to advance conformance with the FDA Voluntary Retail Food Program Standards; essentially, a program of excellence with measurable outcomes and continual improvement. On May 17th Carleo will be attending a Program Standards Sharing Session in Acton. At this meeting, information, materials, resources and support is there to assist all communities working under this voluntary program. Carleo will be there to share information on Standard 2 – Trained Regulatory Staff as well as to pick up some templates for uniform foodborne illness investigations and enforcement policy. A full report on all Public Health Services was provided. For details on these activities such as infectious disease cases investigated and a full report on influenza activity for the season be sure to look for that report in the Public Health Nurse’s newsletter to be published soon. Finally, Carleo provided a brief update from the Animal Care Program. Jean Marcotti our Animal Care Specialist submitted a report stating that Strays in Need currently has no animals in its care. Additionally, quarantines for possible rabies exposures are at typical levels for this time of year. Calls regarding wildlife are on the rise, which is again, typical of this time of year. With that, the Board voted to adjourn their meeting. The Board will meet again on June 1st. This premier newsletter is an attempt to establish clear parameters, and ultimately many facts, around the scope of services provided by the Division of Health and Veterans Services. The Danvers Homepage, which held its kickoff in April 2017, dares visitors to “Ask Us Anything” and my gut is telling me that I need to prepare a response to residents intending to ask us anything by the means of a search engine. So, let’s start with a few notes on what I know about teams. Scholars have studied teams and synergy (the whole is greater than the sum of its parts) and I know that outcomes improve with the employment of a well-functioning team of dedicated employees. I also know that Danvers is fortunate to have a well-functioning team of dedicated employees. Finally, I will share everything I know about our intentions, our skill sets, and our contact information. It is our intention to build your trust through a worthy website for you to “Ask Us Anything”! Mark Carleo is our environmental public health inspector. He is a Registered Sanitarian with a BS and is a full-time employee right here in Town Hall but spends much of his time in the field. His broad scope of work is defined under Massachusetts General Law. You may count on a report specific to some of those tasks in the future but for now, it is most important to know that he is a critical team member authorized to act on behalf of the Danvers Board of Health. Assisting Mark with his many inspections, complaint investigations, and permitting functions is our part-time sanitarian, Melanie Dineen. Judith Ryan is our public health nurse. She is a Registered Nurse with an advanced nursing education, having earned her BSN, and is a full-time employee working directly out of the Danvers Senior & Social Center. Judith spends part of her day performing routine duties with the Supportive Day Care Program. She is also directly responsible for managing reportable diseases, representing the Danvers Board of Health in prevention and public health preparedness programs, and performing other associated duties required of her throughout the day. Examples of these programs and duties will be shared from this site soon with a recap of the 2016/2017 influenza season immediately forthcoming. I promise. Jean Marcotti is our animal care specialist and inspector of animals. She has received specialized training and has an AS degree specific to animal care. Jean works on a part-time basis mostly from her home and in the field but she receives calls 24/7 from this office or directly from the Danvers Police Department. Jean also manages Strays-in-Need and plays a role in the management of our Canada Geese population, our doggie day care facilities and our barns too. But primarily, Jean is involved to some extent with any trouble caused by the 1,521 dogs licensed in Town as of today. As is the case with the other elements of our Public Health programs, you may count on more specific details in future newsletters. Lisa Westrate is our social outreach worker with specialization in veterans’ services, especially those benefits described in Chapter 115 of the Massachusetts General Laws. Lisa is a full-time employee also working directly out of the Danvers Senior & Social Center. Lisa holds a BA degree and is a SHINE Counselor. She is extremely well-versed in outreach programs to veterans but routinely assists in the management of services offered to seniors as well. She has been instrumental in the development of our veterans’ affairs services to the point where Leanne Puleo had to be recruited and employed on a part-time basis to assist her. I know that every team member described above has a sincere cause to help our community and a belief that they can make a positive difference in the lives of our residents, especially our resident veterans. I know that this team is provided with training opportunities and other tools necessary to do the job. I know that President Woodrow Wilson is credited with the quote, “We should not only use the brains we have, but all that we can borrow.” And, I know we will dedicate our collective brains to help you navigate the Danvers Website – a website that dares you to “Ask Us Anything”. Now comes the most important question: Do you want to know more? Visit us and Ask Us Anything.